A natural gas leak prompted the closure of a road in El Cajon Monday. Photo via OnScene.TV. A natural gas leak prompted the closure of a road in El Cajon Monday. The gas leak was reported at 9:37 a.m. after a third party doing excavation work ruptured a 4-inch gas line in the 1000 block of Jamacha Road, San Diego Gas & Electric spokesman Joe Britton said. At around 9:40 a.m., El Cajon police closed off traffic on northbound Jamacha Road at Grove Road and southbound Jamacha Road at Gustavo Street because of the leak, the department tweeted. Utility crews arrived on scene around 9:55 a.m. and were working to patch the ruptured pipe, Britton said. 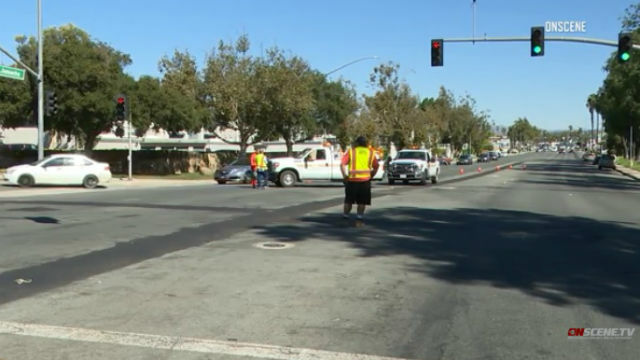 As of 10:25 a.m., the leak had caused a gas outage for about 150 SDG&E customers, Britton said. An estimate for when service would be restored was not immediately available.